Different From Any Other Rifle? One of the key claims the gun industry makes is that an assault rifle is only cosmetically different than any other rifle – this is fundamentally untrue. They are very different from a functional and design perspective, as are other rifles that have been designed as weapons systems for combat. This class of rifle is designed as a modular weapons system to make parts field-replaceable, and can be modified into different configurations based on combat needs. This makes them difficult to define by specific features, but also easy to modify into more lethal (and often outlawed) forms. From a ballistics perspective, assault rifles were originally designed with military ammunition in mind; this ammunition has very different properties from typical hunting ammunition. Assault rifles are typically chambered for high velocity, lightweight rounds, originally designed to wound at medium range rather than kill – because a wounded soldier is more expensive than a dead one. They fragment and tumble inside the body upon impact, causing severe internal damage far beyond the initial point of impact. 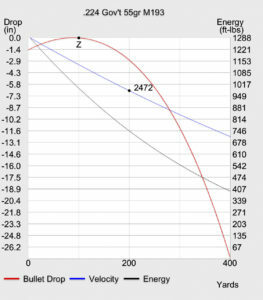 In contrast, hunting ammunition is often lower velocity, heavier ammunition designed to avoid tumbling or fragmenting, in order to ensure the necessary amount of ballistic energy is concentrated into the strike radius of the target. The ammunition commonly used in assault rifles typically over-penetrates at close-range, making them terrible for home-defense or even hunting applications, but the weapon of choice for causing severe physical damage. 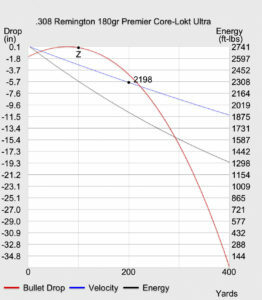 Comparison of the difference in energy between a typical military round (top) and a popular hunting round (bottom). At close range, such hunting rounds have more than twice the energy as the military round, but travel at a much slower velocity. The material composition of these rounds are designed to concentrate the energy into one region of the animal, rather than fragment and tumble, which would cause severe internal damage (and ruin the game). By contrast, military rounds are lighter and fragment, causing severe internal damage; their only effective use is in combat scenarios. 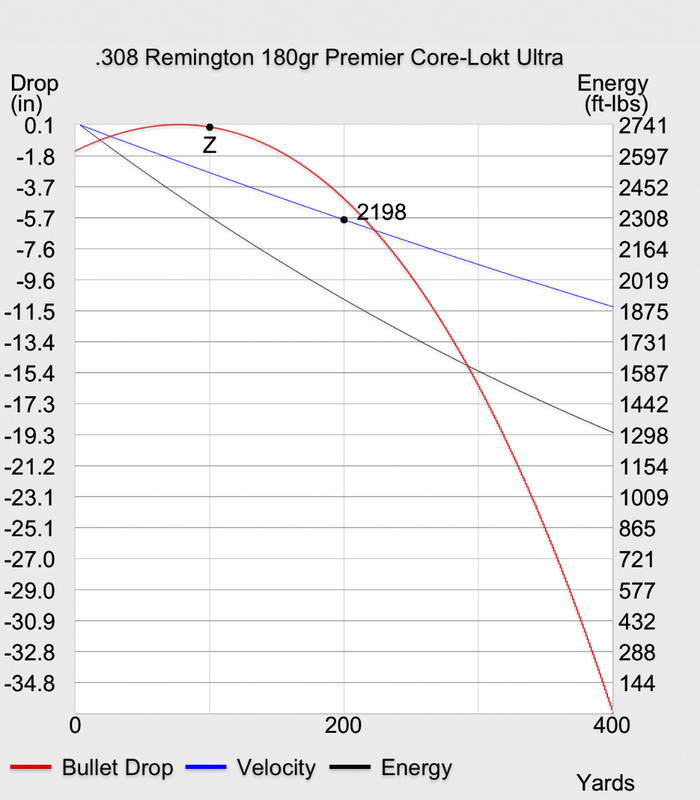 Some attempts have been made to make the platform more hunter-friendly by chambering certain models for popular hunting rounds, such as the .308 Winchester or .300 Beowulf, however the vast majority of rifles are still chambered for, and the barrels still pressure-rated for, the original NATO-spec combat ammunition. Assault rifles are typically designed to cycle quickly to allow for rapid fire, and like most infantry weapons, do so without a significant risk of overheating due to their barrel design. Infantry rifles have barrels that are designed to dissipate heat quickly to withstand rapid fire without degrading, and can tolerate the higher pressures needed in order to shoot high-velocity rounds. Direct impingement, one of a few popular systems used in assault rifles, uses the blowback from the round to cycle the action quickly by injecting the gas directly into the bolt carrier, allowing the firearm to be designed lighter and shorter (more compact) than conventional piston-operated rifles, and can fire more rounds over the life of the firearm with reduced wear. Both the barrel materials, as well as techniques such as chrome-lining help further lengthen life and reduce the corrosion and wear caused by high rates of fire and subsequent overheating combined with the high pressure of the round. In contrast, hunting rifles typically overheat after a small number of rounds, and lose accuracy quickly by design due to the cost and lightweight carry needs balanced with hunting regulations often limiting the hunter to three or five rounds anyway. The action found in most hunting rifles are bolt, lever, or sometimes pump … bolt typically offering the most consistency, tightest chamber, and least amount of internal movement (all of which affect accuracy). Bolts have an action that don’t generate movement while the bullet is leaving the barrel, including the casing, which is held in place, and they don’t need to absorb energy or redirect gas to cycle the next round, allowing each shot to remain perfectly consistent. Bolts allow for a lighter trigger pull without affecting safety, and are usually considered the most reliable of all types of actions. Recently, accurized versions of semi-automatic rifles have come into the market that can match that of a bolt action in performance, but lacking the other mentioned benefits. This has been more of a propaganda strategy by the industry to usher military style firearms into the hunting community to legitimize them. Lastly, assault rifles accept a detachable magazine that allows for quick reloading in combat, but serves no practical purpose elsewhere. There are some low capacity hunting magazines, however even these seem to have their origins in shorter military magazines designed for prone firing. A majority of hunting rifles are direct loaded through the chamber for best accuracy, or loaded into an internal magazine, which satisfies virtually all sporting needs. Some would argue that AR15s are used by hunters, however as I’ve mentioned, this is part of a larger inside effort to justify assault rifles by means of adoption into the hunting community. A hunting version of an AR15 could be made functionally less lethal as hunters are limited to five rounds; this would look more like a California compliant AR15, in which the magazine well were welded shut, and the rifle would have to be manually loaded with five rounds at a time. If hunters insist that they require the AR15 platform to hunt a deer, the detachable magazine can and should be eliminated from the design to justify this. California has already proven this is possible, and the rifle can not accommodate a 30rd magazine, even if one were purchased or 3D printed. So in spite of the propaganda to the contrary, military rifles have quite different functional characteristics from your average rifle, and if they weren’t more deadly than a hunting rifle, there wouldn’t be such a market for them among die-hard survivalists, anti-government militias, or misguided home defense users. If assault rifles weren’t so effective at killing, people wouldn’t rush out to panic buy them every time a democrat is elected, or any time there is civil unrest. My gun collection is a lot smaller than it used to be. I used to own several of the AR-15s I’m referring to, as well as AR-10s (the .308 version of an AR-15). Some people buy them either because they’re ex-military and comfortable with the platform, but many more mistakenly for home defense, or for various domestic war scenarios (militia, civil war, invasion, disasters, and other doomsday plans). I bought mine because they’re fun to shoot at the range, and I was fascinated by the platform. I have extensive experience with how they work, how they don’t work, how to rebuild one, how to be safe with one, and how to disarm someone being reckless at the range with one. Unfortunately, most aren’t this well versed when they purchase an infantry rifle, and probably don’t know very much about them, or how to be safe with them. At the end of the day, a rifle being “fun to shoot” or fascinating isn’t a valid reason to leave them unregulated. After all, silencers and machine guns are fun too, but they are heavily regulated. Small arms in general (even fully automatic ones) aren’t any good for “defending” a country against a tyrranical government, in spite of what the gun industry has sold as a militia-man image. Our government has taken down countries with armies of full automatics, ground to air missiles, and much heavier weaponry than civilians can legally own in the US. SWAT teams have taken down groups with such weapons within the United States, as well. It is pure fantasy to think that a group of people with these firearms could possibly keep the government “in check” or even at bay for very long. A similar belief is somehow assault weapons will prevent another genocide. Germany’s solution to Hitler wasn’t to do away with firearms regulation. Germany’s solution to Hitler was a national reckoning, which many are still feeling, and a cleanup of the society by means of denazification through the ongoing occupation and reconstruction of Germany under the Potsdam Agreement. Society was forced to change. Against a Nazi regime, banning gun registration would have had zero impact against a force of evil such as Hitler’s, and may have actually made door-to-door confiscations more violent and cruel (if that were possible). A federal registry was a simple convenience, and not a necessity, for the Nazi regime – claiming differently is merely another point of propaganda sold by people that haven’t studied history or understand the brutality of the Nazis. I don’t hate guns, but I do hate that anyone can get access to a semi-automatic rifle easier than they can get certain types of cold medicine. I don’t believe that having sensible controls on access to firearms constitutes tyranny. The nature of society will dictate how much control needs to be applied. As Ben Franklin (who gun owners love to misquote) once said, “Only a virtuous people are capable of freedom. As nations become more corrupt and vicious, they have more need of masters.” Franklin would be rolling over in his grave if he saw the narrative of today’s NRA. We’ve become so desensitized to how violent society in the United States has become, that many think this is the peaceful norm. Travel to any other civilized country, and you will be shocked to see what a peaceful people are really like. Many argue that assault rifles are statistically insignificant. It’s quite true, the number of people killed with rifles is much lower than handguns. What the statistics don’t show is the ratio of random mass homicides between handguns and rifles. Handguns are at the top of the list of homicides in general, but that gap is much narrower when you’re talking specifically about mass murders. When it comes to random mass murders in the United States, not only do more and more lately involve an assault rifle, but the most heinous of all mass murders – those involving school children, public crowds, and other complete innocents – are almost exclusively committed with assault rifles. It is these random massacres that we should be analyzing, not the majority of other homicides that have no bearing on the public at large. The question, of course, is how you can control access to assault weapons and do it effectively, and in a way that will matter in light of all of the panic-buying that occurs after every tragedy. The Federal Assault Weapons Ban of 1994 was a miserable failure, primarily because democrats are, by nature, terrible at writing firearms legislation. Future attempts to renew the ban were just as embarrassing, watching our country’s representatives completely fail to even explain the scary features they were banning. As a result of the AWB’s poor construction, gun manufacturers ended up designing slight variants of the popular firearms covered in the ban. For example, an AR-15 with a muzzle brake instead of a flash hider, fixed stocks, and without a bayonet lug. While the legislation may have cut back on drive-by-bayonetings, it did virtually nothing to remove any of the firearms it banned from circulation. Magazine bans were a similar embarrassment. Due to loopholes in the legislation, large caches of 30rd magazines (and 90rd drums) were easily imported and sold in virtually every gun shop during the ban. During the entire period of the AWB, gun owners sat comfortably with either pre-ban AR-15s or post-ban XM-15s that were identical in functionality, and with a safe full of legally owned 30rd magazines, laughing at the senators who wrote the legislation, who wouldn’t know an assault weapon if they sat on one. Should the same ban be reinstated today, things like magazine bans are even less likely to succeed with 3D printing, and the industry has become much wiser in how to skirt around the “scary features” laws. Therein lies the core issue: there’s no legal definition for the term “assault weapon” or “assault rifle”; it’s difficult to define, too, because of their modular platform. Outside of the legal world, gun rights activists will tell you that this term is exclusive to machine guns, but even this is simply not true. Consider the AR-15 again: While the “AR-15” is the semi-automatic version of the popular full-auto M-16 rifle (the AR actually stood for “ArmaLite”, the original manufacturer), the military also got quite sick of their soldiers wasting so much ammunition (without hitting anything), and began issuing rifles with either tri-burst mode (instead of “full” auto) or in some cases exclusively semi-auto, along with teaching better marksmanship. All three configurations have been used in combat, and all three are assault rifles by any reasonable definition. Other than minor variations between manufacturers, the only parts that are mechanically different are the fire control components: an auto-sear, an M-16 bolt, and the spur (“J” hook) on the trigger. 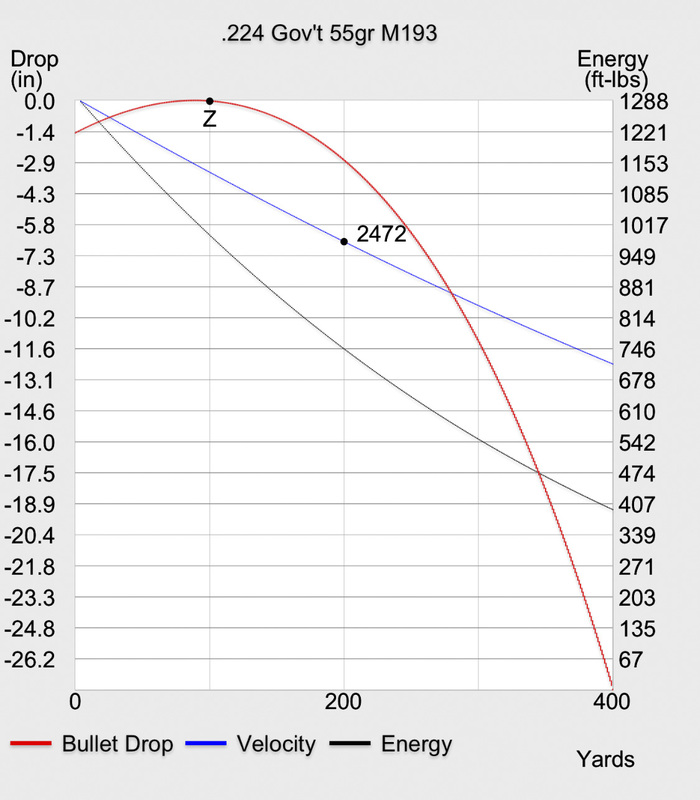 These components determine whether you get one bullet per pull, tri-burst, or a spray. Gun owners often seek out the Colt 6920 because it’s closest to the milspec of the M-16, and even has the cutout in the lower receiver for an auto-sear, to be converted to fully automatic. To call one of these an assault rifle and not the others because of its configuration is childish, and more Kool-Aid circulated among gun owners. The issue with assault rifles isn’t so much their existence; it’s a matter of who’s owning them. There are certainly a large number of responsible gun owners out there who are not committing mass murders. At the same time, there are many disturbed individuals, probably many of whom are already under investigation, or have been in and out of mental institutions, indoctrinated by conspiring militia groups, or have other issues that most of society wouldn’t think should have access to an assault weapon. A handgun to protect themselves? A shotgun? A bolt action? Perhaps (depending on a case-by-case) – but an assault rifle? That’s in a different class of its own… capable of killing a much larger group of people in a shorter period of time. Yet we still don’t treat them any legally different than a 12-gauge shotgun, or even a plinker gun. And that’s the problem: Firearms like the AR-15 really aren’t in any legal class of their own, like machine guns are. The same person who can buy a shotgun for home protection can also buy an AR-15 – a combat rifle (with the exception of the full auto) – capable of killing a lot of people much faster than a shotgun. All NFA items must be registered with the Bureau of Alcohol, Tobacco, Firearms and Explosives (ATF). Private owners wishing to purchase an NFA item must obtain approval from the ATF, obtain a signature from the Chief Law Enforcement Officer (CLEO) who is the county sheriff or city or town chief of police (not necessarily permission), pass an extensive background check to include submitting a photograph and fingerprints, fully register the firearm, receive ATF written permission before moving the firearm across state lines, and pay a tax. The request to transfer ownership of an NFA item is made on an ATF Form 4. Many times law enforcement officers will not sign the NFA documents. There have been several unfavorable lawsuits where plaintiffs have been denied NFA approval for a transfer. These lawsuit include: Lomont v. O’Neill, Westfall v. Miller, and Steele v. National Branch. In response, fourteen states have enacted laws which require the CLEO to execute the NFA documents, including Utah, Kansas, Arizona, Alaska, North Dakota, Oklahoma, Louisiana, Arkansas, Kentucky, Tennessee, Ohio, West Virginia, North Carolina and Maine. In other words, there is already a system in place to perform strict checks of individuals looking to own highly lethal firearms that were at one point considered too dangerous to arbitrarily just sell to anyone at a gun shop. The NFA also applies to silencers, sawed off shotguns, and other types of firearms. There’s also no way to simply lie your way through this check. It doesn’t hinge upon the applicant declaring their background; it is a true background check, and requires a local chief law enforcement officer’s signoff. The alleged bump-fire components used in Las Vegas were, at one point, controlled by the BATFE under a 2006 decision labeling one such device (the Akins Accelerator) as a machine gun. Why the BATFE didn’t continue to aggressively pursue these newer devices as such is a mystery. When the Akins Accelerator was ruled a machine gun, BATFE went after the customer list and owners were forced to surrender the springs that made them work. Because it’s such a modular platform, however, any new devices to assist with fully automatic fire can easily be developed and attached to an otherwise semiautomatic rifle; 3D printing makes it even easier to create such a bump-fire device. The problem at the core of controlling full automatic fire, then, is to control semi-automatic fire. The NFA provides the groundwork for what could serve as a central point of regulation of semi-automatic firearms (and possibly even detachable magazines that hold more than a certain number of rounds), and once in place for semi-autos, could be built upon to impose better background checks or other much needed inspections. You may also choose to only include centerfire rifles, rather than rimfire (such as little .22 plinker guns). On the other hand, a .22 is all too often treated like a toy when it is lethal as well. There are too many gun owners, in my opinion, who treat .22 like a lollipop and let their kids shoot them in the backyard, when in reality they can do a lot more than put an eye out. Under NICS, you provide only very basic info, and it’s easy to get around a background check if you use a fake ID. Since the gun shop is responsible for taking that information down, fake identification goes a long way. The checks are mostly declarative as well; that is, the buyer has to disclose whether or not they’re disqualified from purchasing a firearm, as in many cases the information is simply not available to NICS due to the limited information provided. Even if they’re not using a fake identity, there’s very little information given; no fingerprints, no photo – the only thing that goes to NICS is a name and address (even social security number is optional), which is one reason things like dishonorable discharge (as in the case of the recent Texas shooter) don’t show up. Under NFA, you also submit a photo, fingerprints, have an extensive background check to either purchase an assault rifle, or to register an existing one during an initial “amnesty” window. In many cases, one would also require a letter from the chief of police etc). To help ensure that the identity is not fake, there is also a transfer fee which requires a payment, and so a check, credit card, or other paper trail will have to exist tying to the individual’s identity. Here is the link to the ATF Form 4 and the FD-258 fingerprint card. The NFA system is more extensive, but can be made even more so on background checks by opening up mental health records and tying into a number of federal databases that NICS presently isn’t very well tied into. NICS checks only go to the feds for long guns purchases, and goes to the state for handguns. This is why you can buy a long gun in any state, but can only buy a handgun from your home state. Information sharing isn’t so great between the two, from what I’ve heard, and there have been attempts to rectify that. By looping in the local CLEO (chief law enforcement officer), you have additional local background that can become part of the background check. Were the police called to the applicant’s home 30 times in the past year? Was the child expelled from school for violent behavior? The CLEO can address this before the applicant is ever allowed access to the firearm. NFA takes 6-12 months on average, so the applicant won’t be able to take possession of the firearm until after the background check has concluded. This is what happens with machine guns already when purchased from class-3 dealers. Those planning terrorist attacks, such as in Orlando, are going to have to plan well in advance. Also of note, those with escalating violent tendencies may already be on the edge by the time they purchase the firearm, leading to a crime or other event prior to the check concluding, that would disqualify them from ever taking possession. Since the NFA system doesn’t run at light speed, like NICS does, the time is there to interface with investigatory agencies so that they are made aware when someone under investigation or on a watch list are looking to purchase an assault weapon. This would also result in a mandatory waiting period for assault rifles, but not affect other firearms. At the moment, NICS is insufficient for information sharing: it’s instantaneous, giving no preparation time, and in many cases, the law forbids the information from NICS to be forwarded to investigative agencies. The Assault Weapons Ban made the mistake of grandfathering rifles. When the NFA first went into effect, however, machine gun owners were given a window where they could register their machine guns. Once that window closed, any unregistered MGs were considered illegal, and there are stiff penalties for possessing an unregistered machine gun. You can’t even bring such a gun to the range because you have to carry it around with the ATF form and a stamp. Many ranges check these if they see a machine gun, and there are also a number of ATF stings / monitoring going on at many ranges. In other words, that gun will have to move completely underground, and most gun owners hate that idea. Within half a generation, unregistered assault weapons will end up in the hands of the owners’ children, but they will be in the same boat – subject to prison if they do not turn it in or have it destroyed. This also snuffs out private sales of unregistered assault weapons, as there would be no legal way to register it outside of the initial registration window. In other words, once that window closes, if you don’t register a rifle, it turns into a stolen car – it’s a hot item, and very few are likely to touch it. There is a significant financial incentive for gun owners to register existing firearms, in this case, as all of their panic buying will lose considerable value otherwise. An all-out ban does nothing to address the millions of firearms already owned, however going the direction of the NFA forces all of them to be accounted for, or the owner risks the change of criminal prosecution if they’re ever caught with an unregistered “assault weapon”. As personal, private transfers go, those of machine guns are also illegal, unless they go through the NFA process for the new owner. In other words, there’s a paper trail now any time an assault weapon is sold, and the government is aware of who is in possession of it, as well as has their prints, photo, and other information. Today, you aren’t required to give any account for where a gun came from, whether it was purchased legally, whether a background check was done – a gun could literally show up on the street, and there is no accountability at all. As far as 3D printing and 80% builds go, today pretty much anyone can legally build their own semi-automatic rifle today. The gun industry manufactures 80% receivers, which are lower receivers without final machining, just to keep them legal enough to where they don’t constitute a firearm. They can be purchased over the counter (or mail order) without pesky criminal background checks, then completed into final firearms with minor machining. All of the other components of the rifle can then be purchased and assembled into a working rifle, skirting NICS or any other safeguards in place, just like a private sale. They have the added benefit of not needing to be registered (or even engraved with a serial number) unless you sell them; only when you sell them do they require an ATF Form 1. Gun owners have stocked up both on complete lower receivers (which are traceable and engraved) as well as 80% receivers (which are not usually traceable or engraved) in the event of an all out “ban” to eventually build out into complete rifles. The way that NFA restrictions are structured, it prevents gun owners from arbitrarily building their own restricted firearms (for example, machine guns or short barreled rifles) without approval from the ATF (and only manufacturers are ever allowed to build new machine guns). By classifying semi-auto rifles under NFA, the same restrictions get applied to AR-15s (or other semi-automatic rifles), forcing registration of existing, complete stripped lowers, and banning home-brew builds without registration. All that poor-man’s panic buying will have served no little purpose, as every lower receiver will ultimately need to be registered just as a complete rifle would, otherwise it becomes a worthless, unsellable unregistered firearm that the owner can’t even take to the range. Extending NFA to cover the manufacture of detachable magazines may also help to curb home-brew fabrication. The BATFE has the ability to issue rulings and make exceptions for specific hunting / sporting rifles they don’t want to consider assault weapons. Their ruling process occurs in writing and they’ve handed down a number of specific rulings as new products are introduced (they’ve done this with machine guns, silencers, and other items already covered under NFA). This allows legislation to be drafted broader, so that it can be imprecise enough to cover all semi-automatic long guns with detachable magazines (for example), but grant the power to the BATFE to make exceptions for any rifle they believe falls more into a “hunting” category. Would it Have Made an Impact? Based on what facts are available, it would have likely prevented the most recent school shooting in Parkland, FL at a number of different points (including likely the local CLEO from signing off). It would have prevented a number of other recent shootings where there were signs of mental health issues, dishonorable discharge, and other trails on record that the BATFE would have seen during their background check. Paddock, the Las Vegas shooter, bought 33 guns in the 12 months leading up to the shooting; some reports suggest he made a bulk purchase in 2016. The NFA process is slow and often takes six months or more to obtain a single tax stamp; along with a $200 tax stamp fee, fingerprints for every application, extensive background check, and other delays, it’s likely Paddock would have been able to only transfer a small number of semi-automatic rifles within that time frame assuming he passed all checks and wanted to go through the hassle. He obviously didn’t want to go through the hassle, though: Paddock chose a low budget means of obtaining full auto fire; a means that the ATF had flirted with outlawing, but didn’t follow through on. He could have purchased real (and more reliable) full auto machine guns under the NFA, but he didn’t. Had he made several purchases, it would have put him on BATFE’s radar. Instead, he stayed off the grid by “hacking” together a less reliable, and slower fire version of a full auto. If semi-automatic rifles had fallen under the NFA program, there’s a good chance he would have had the same aversion to the NFA process as he obviously had with buying machine guns and not purchased semi-auto rifles. His goal was to avoid detection. The economics of the NFA can also be a powerful effect on most recent mass murders. During and after machine gun registration under NFA, and particularly after new registrations were closed off in 1986, the prices of those firearms were driven up substantially to 10-20 times their original price. A full auto machine gun today costs anywhere from $10,000 – $20,000 to purchase simply due to supply and demand. Semi-automatic rifles, had they fallen under the NFA, could become an issue of supply and demand, making them both more difficult and more expensive to get a hold of. In other words, assault rifles end up being an exclusivity. By this alone, the NFA would have unquestionably prevented several other mass murders from occurring, likely including Sandy Hook. Even without the economic effects, however, the simple fact that the process requires both government visibility and accountability would have prevented a number of criminals from otherwise taking possession. The more thorough background check element of the NFA would have prevented the recent Texas church shooting; here, the shooter had already been denied a concealed carry permit due to such a background check, yet was still able to purchase the rifle. Had the rifle been under NFA, he wouldn’t ever have been allowed to take possession of it. Obviously, there’s something in the system about him that was enough to fail a background check had he been put through a real one. I’ve watched the gun community change dramatically over the years, and today’s gun culture is far detached from the once even-tempered, responsible gun owner that is its heritage. The beliefs that gun owners hold to as truths today are not rightfully the values of the founding fathers, but rather a product of good marketing. While the NRA has long spent hundreds of millions selling the freedom loving militia-man image to gun owners, founding fathers like Ben Franklin took the position that the more vicious people became, the heavier regulation they required. A recent study concluded that the people who feel most empowered by guns are white, socially alienated, financially unstable individuals who have a strong belief that violence against government may be necessary, and oppose mental health checks. This is exactly the crowd today’s NRA seems to be catering to. The gun industry, meanwhile, manipulates many into buying more of their products to protect themselves from the gun crimes that happen in this country they helped create. They’ve lobbied to make sure criminals can get firearms so that they can sell the same firearms to others to protect themselves against the criminals: this is not far from how organized crime operates. The belief that our identity as a country somehow has to be intertwined with the right to kill each other is the biggest fallacy we’ve ever been sold by capitalism. This faulty belief system is largely why nothing has moved in legislation for decades, even in light of ongoing random acts of mass murder in this country. Sandy Hook was really the point of no return for our country. As we watched our government and NRA’s non-response to the murder of 20 school children, I knew then and there that we’d never do anything meaningful to control mass murder in this country. Sandy Hook was the day politicians and lobbyists alike demonstrated they had no soul. At the end of the day, this is not a patriotic battle we’re fighting, it’s a battle of industry dollars. The end result of reclassifying semi-automatic rifles is that you are not denying gun owners what they perceive as their right to own these firearms, nor do you have to care about all of the panic buying that happens every time there is a massacre. Let people panic buy all they want. The NFA can be applied in a fully retroactive way, as it was with machine guns. It requires no attempt at confiscation (which would fail miserably), and gives responsible gun owners a window to decide whether they want their assault rifles enough to submit to reasonable accountability. The far right in the gun community will argue that this is tyranny, and that the people should be given absolute power. I disagree. We are not living in Hitler’s Germany, and if we were, that mindset would have been on the wrong side of history. If you’re going to possess an infantry rifle, you ought to be subject to some accountability by those entrusted with governing the people. The ones who don’t think they should be accountable to anyone are the ones who shouldn’t own guns. More people have died from gun violence in this country than in all of our major wars combined. Think about it: This means more people have died because of gun rights than all the people who ever died for gun rights. Unacceptable. What’s more unacceptable is that it only took the murder of seven (7) individuals in the Valentines Day Massacre to get the ball rolling for the NFA and its sweeping gun legislation… yet 58+1 died in the Vegas massacre, 28 in Texas, 17 in Florida, and we’ve lost whatever humanity we once had to even bat an eye. The fact that we are discussing school shootings yet again, with nothing different this year is a sign of just how ineffective our government has become. The fact that politicians are dodging the issue yet again is evidence to just how soulless. God will judge us all if we continue to allow this.